Baylor scored first on a McClure layup but didn’t have the lead again until the early stages of the second half. South Dakota’s deliberate pace limited Baylor’s possessions, and that was magnified by a 19-9 edge in second-chance points for the Coyotes. Those were the last points for the Coyotes, who missed their final 10 shots. South Dakota led by as many as nine in the first half and for 30:13 of the game’s 40 minutes. South Dakota: The Coyotes were 4 for 8 from 3-point range in the first half, but made only one of their 17 tries from distance in the second. The Coyotes appeared to be quicker to loose balls for most of the night and had a 42-41 advantage on the boards but Baylor’s length in the lane bothered them to the tune of 12 blocked shots. Baylor: The Bears never got the tempo up to the point where they could use their athleticism in the open floor to their advantage. Kegler was anxious to get shots up early, and he missed badly on his first five – including three that missed everything — before settling into the flow of the game. The Bears pounded the ball inside more in the second half and shot 50 percent (13 for 26). South Dakota will host Cal State-Bakersfield on Saturday. 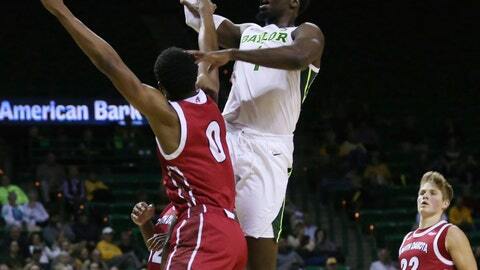 Baylor goes on the road to face Wichita State on Saturday.